An act designating the Oyster Shell, (Crassostrea virginica,) as the State Shell was approved April 12, 1974, Chapter 551, General Laws of Mississippi of 1974. Oysters are soft-bodied animals that have two hard, protective shells (a bivalve). They spend their entire lives in one underwater location. 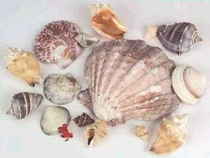 The shape of the oyster's shells varies, depending mostly upon how crowded they are in the oyster bed. 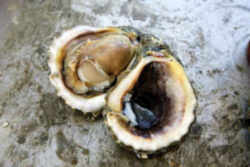 Oyster shells are made of calcium carbonate (lime). The oysters must get this lime from the water they live in. They also have a sort of skin, called a mantle, which puts this calcium carbonate on the outside of their bodies to form a protective shell. 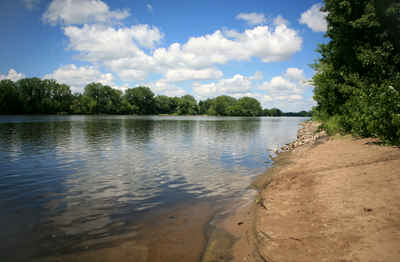 Oysters must live in water that is temperate (warm all year) and not too cloudy. They grow only in areas where salt and fresh water mix together, like salt marshes. Oysters are born as free-swimming plankton (tiny microscopic organisms). When they grow up, they find a place (on mud, coral, debris, or other oyster shells) to attach and grow. Once they grow their shells, they can't move around anymore. When the tide is high, oysters are covered by water, but when the tide goes out, they are left sticking up into the dry air. 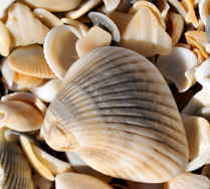 Their shells close tightly together so the animal inside will not dehydrate (dry out) before the tide comes back in. The oyster's mantle (skin) makes both an outer white crusty shell, and a smooth inner shell. The smooth inner part is called "nacre" or "Mother of Pearl." Sometimes a bit of sand gets inside the oyster's shell. This is very irritating to the oyster, like getting an eyelash in your eye. So the oyster covers this bit of dirt with shiny smooth Mother of Pearl. It keeps covering the dirt and rolling it around until it doesn't cause any more irritation. This makes a pearl. The oysters that people eat in north Florida (Eastern oysters) hardly ever make pretty pearls. But there are other kinds of oysters, clams, mussels, conchs, whelks, and even abalone that do make nice pearls. We think of pearls as being round and white, but they are often yellow or black, and many other colors and shapes. The law designating the oyster shell as the official Mississippi state shell is found in the Mississippi Code, Title 3, Chapter 3, Section 3-3-13. The oyster shell is hereby designated the state shell of Mississippi. SOURCES: Laws, 1974, ch. 551, Sec. 4, eff from and after passage (approved April 12, 1974).